Porsche LMP Team celebrates a double victory at 6 hours of Nürburgring, the fourth round of the 2017 FIA World Endurance Championship. For Brendon Hartley, Timo Bernhard and Timo Bernhard in the #2 Porsche 919 Hybrid it’s the second win of the season after they won 24 hours of Le Mans in June. Their teammates in the #1 car Andre Lotterer, Neel Jani and Nick Tandy finished the race in the second place after 204 laps, capturing their second podium of the season. The #7 Toyota TS050 Hybrid finished in the third place, after starting from pole position secured by the best qualifying time of Kamui Kobayashi and Jose Maria Lopez, who shared a car with Mike Conway. The #7 was in the lead for 43 laps before Porsches took over. A fuel pump issue ruined the race for the #8 Toyota which was fourth on the starting grid. The problem appeared during the formation lap and Sebastien Buemi was forced to pit before the race even started. The car returned to the race but lost six laps, finishing in the fourth place. 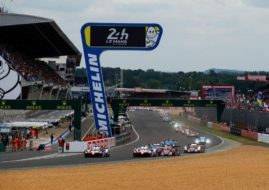 In the LMP2 class, the #38 Oreca of Jackie Chan DC Racing repeated a triumph from Le Mans by winning the second race in a row. Victorious drivers in the #38 car were Oliver Jarvis, Thomas Laurent and Ho-Pin Tung. They beat the #31 Vaillante Rebellion Oreca for one lap. The drivers in the #31 car were Bruno Senna, Julien Canal and Filipe Albuquerque. Nicolas Lapierre, Gustavo Menezes and Matthew Rao completed the LMP2 podium in the #36 Alpine A470 of Signatech Matmut Alpine team. Alessandro Pier Guidi and James Calado clinched the second GTE Pro victory of the season for AF Corse and the first win for their #51 Ferrari 488 GTE. They won with 50-seconds advantage over #91 Porsche 911 RSR of Richard Lietz and Fred Makowiecki. Kevin Estre and Michael Christensen doubled up a celebration for Porsche GT Team, finishing in the third place with #92 car. The successful day for Porsche is rounded by GTE Am class victory of Dempsey-Proton Racing #77 Porsche 911 RSR of Christian Ried, Matteo Cairoli and Marvin Dienst. The #54 Spirit of Race Ferrari finished in the second place, driven by Miguel Molina, Francesco Castellacci and Thomas Flohr. Aston Martin Racing reached third place in the GTE Am class with #98 Vantage, driven by Pedro Lamy, Mathias Lauda and Pedro Dalla Lana. The next round of the championship is scheduled for September 3 at Autodromo Hermanos Rodriguez in Mexico.